AGANA, Guam (CNS) — No matter the outcome of a Vatican trial against Guam’s archbishop, Archbishop Anthony S. Apuron of Agana should not return to lead the archdiocese, said the archdiocese’s coadjutor. “I think it would be a disaster if Archbishop Apuron were to return as the bishop of record,” said Coadjutor Archbishop Michael J. Byrnes, because of the extent of the loss of trust among the faithful and the “widespread disarray” left behind in church operations. Coadjutor Archbishop Byrnes, a former auxiliary bishop of Detroit, spoke to the press in Agana July 6, offering an update of the canonical investigation and trial of Archbishop Apuron and his own personal thoughts about what would be best for the archdiocese moving forward. U.S. Cardinal Raymond L. Burke, a church law expert and former head of the Vatican’s highest court, led a Vatican team to Guam in February to investigate allegations of sexual abuse leveled against Archbishop Apuron. “In the next several weeks,” three judges will convene at the Vatican to deliberate the evidence gathered during the investigation, publish what the accusations were and then decide among three possibilities: “not guilty, guilty or not proven,” he said. It could be “end of summer, early fall,” or later for the Vatican to release its decision, he added. Archbishop Byrnes said even if his predecessor is found “not guilty” of any charges, it would be unwise to let the archbishop return. “I think and I’m convinced, actually, that this archdiocese would be unable to achieve peace, really, until it’s clear that Archbishop Apuron is no longer the bishop of record of this diocese. And I don’t say this on the basis of the trial, I say this on the basis of my experience here, what I have found in the last seven months,” ministering to and serving the church there, he said. “Some of the consultative bodies were not being utilized in the way they should’ve been used. Some of the policies that had been around for a long time, for instance the sexual abuse policy, was sorely lacking in its bite, in its clarity of a solid process to deal with these kinds of things,” he said. “There’s been a tremendous loss of trust that’s really hard to win back,” he said during a question-and-answer session. 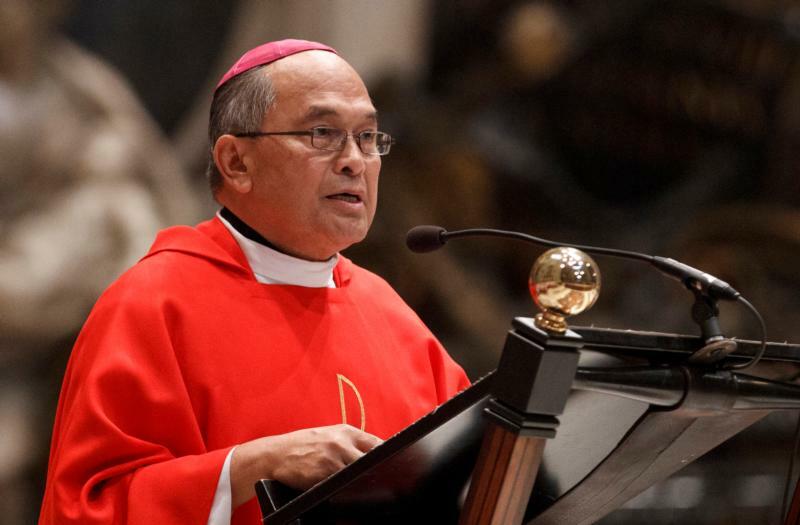 The loss of trust will demand hard work and greater transparency and having Archbishop Apuron return even if nothing is proven or he’s found not guilty “would just, I think, exacerbate this loss of trust” in the church. “I feel that the sentiment of a lot of the faithful is ‘We need something different, something new,'” Archbishop Byrnes said. “The past has to become the past so that we are able to move forward in peace and continue the real building of the church” and doing what Catholics depend on the church to do, “even on the nitty gritty, administrative, financial, pastoral infrastructure of the island,” he said. “I’ve already seen come great changes, we’ve got awesome people with great hearts, but it’s going to take a lot,” he said.